Cut a large tree from the green paper. Punch holes in the center. You will probably have to punch each one twice to get it large enough to insert the pencil. Don’t try to punch all the layers at once. Insert a pencil through the holes. 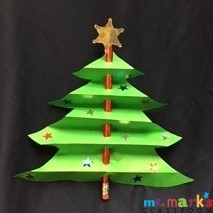 Decorate the tree with star stickers.